Congratulations to the top finishers of this year’s World Championships! 2016-2017 will go down as one of the most momentous, eventful seasons ever, so a bit of reflection on the big show would be worth all of our times. Today I’ll be looking over the top eight decks, with emphasis placed on in-depth analysis of the three archetypes that shined the most. Let me be clear: Despite Standard rotating, these results and deckbuilding principles are still 100% relevant to the 2017-2018 season! Worlds may be over, but Ft. Wayne is in less than two weeks, and the Standard season is about to kick off with Connecticut Regionals. Therefore, the constant year-round Pokemon TCG season makes it essential to develop good deckbuilding principles and metagame reads. Overall Impressions: Going into Worlds I felt bullish about Gardevoir GX’s day one prospects, but less confident in its Day Two hopes. While the results of Worlds Day One informed the Anaheim Open competitors well enough to keep Gardevoir from winning that event, in Day Two it successfully brought home $30,000 to Latin America, placing 1st and 7th respectively. If you’re a big HeyTrainer blog fan, you’ll notice that Diego’s list looks pretty similar to the sample build we posted last week. However, the six cards’ difference are actually very important, and communicate to me a veteran who perfected is winning deck. 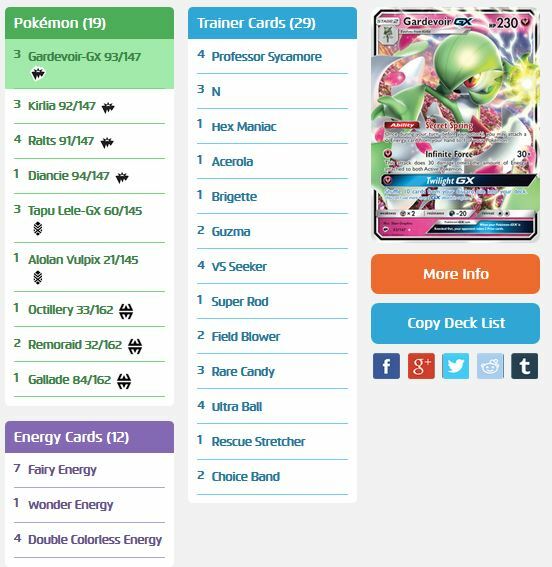 Gardevoir Line: Diego runs a thick Gardevoir/Gallade line, as have other lists. This is to guarantee that he gets out two or more Ralts line Pokemon by the third turn. It’s also a metagame decision because of the prevalence of Vileplume AOR and to minimize the number of items used against Garbodor GRI decks. 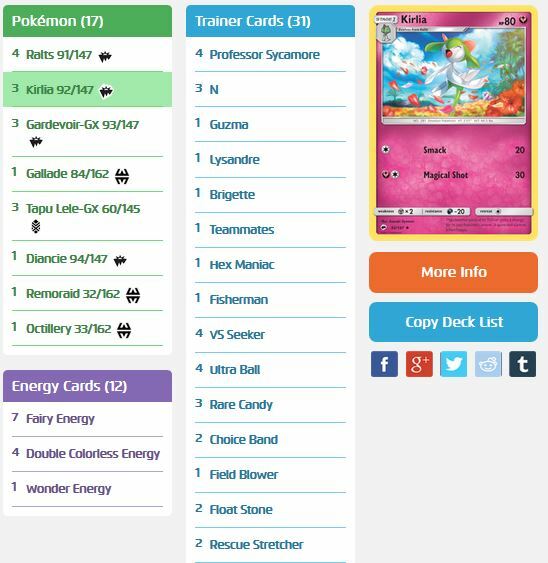 2-1 Octillery, 1 Diancie, 1 Alolan Vulpix, 3 Tapu Lele GX: I’ll analyze all of these in a group because I think this is the key to what makes Diego’s championship-winning list superior to our sample list. When constructing a finalized deck list, players seek to build something that has the most outs to bad hands as possible – and by “bad hands” I mean unplayable ones. Here, Diego runs four immediate outs through his Pokemon alone, and when combined with his full Trainer line runs a cool 16 outs: 3 Tapu Lele, 1 Alolan Vulpix, 7 draw Supporters, 1 Brigette, and 4 Ultra Ball. 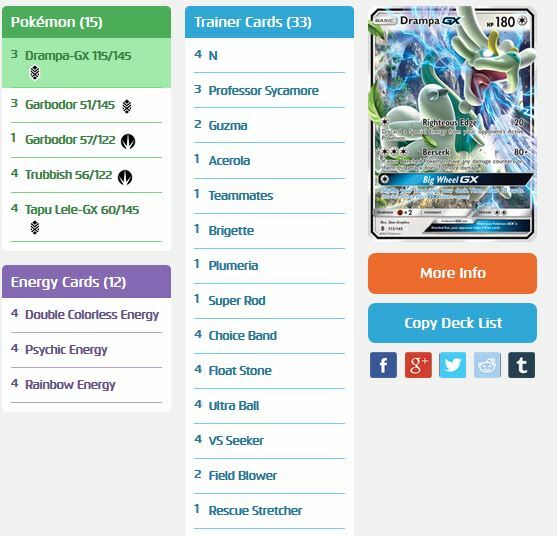 Start piling on the cards you can’t always use instantly but are still helpful, such as Diancie/Gallade/Octillery, and you’ve got what’s sure to be a consistent, fun Worlds deck to buy in a couple months. 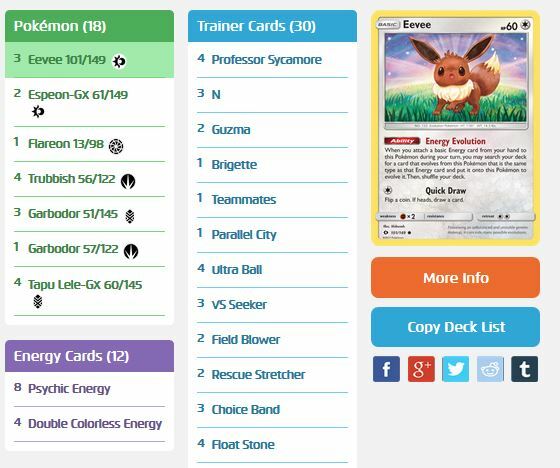 One difference between this list and others is Diego’s 2-1 Octillery line. I like this over a thick 2-2 or a 1-1 because the 2-1 is less space, yet at the same time far more reliable than a 1-1, which is much more prone to be prized. I believe a 2-1 line was the best call in hindsight. 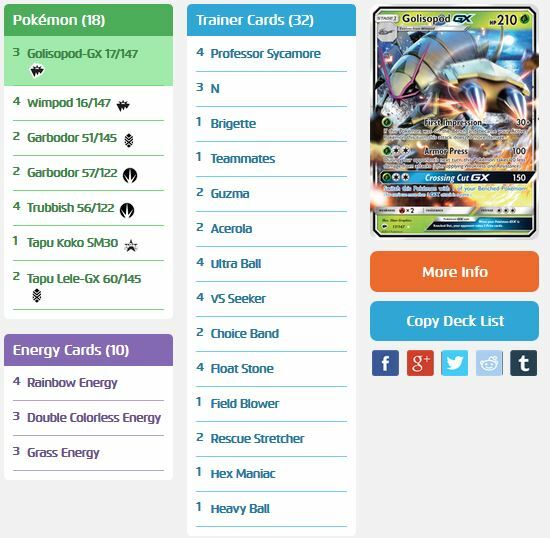 Pure Guzma over Lysandre/Guzma split: Although I was mostly an advocate for pure Guzma over the Lysandre/Guzma split, which turned out to be the correct call, it’s in this single deck where I did not make that decision. Diego did however, and for all the consistency additions, it makes sense not to want three luring effects. Acerola: Acerola became an essential tech in Gardevoir builds, and in my mind is probably what gave Gardevoir players wiggle room against the normally difficult Decidueye matchup. It’s also a great choice in any Gardevoir build for either Standard or Expanded because it encourages swarming while also protecting resources. Wonder Energy: Wonder Energy is an example of a card that probably made a big difference in early rounds, but became less impactful as the event progressed. In my opinion it works better in a list like Pablo’s with Teammates, whereas in Diego’s list you’re sort of forced to just draw into it at the right moment. There’s a calculated risk involved in that, such as running a singe Field Blower in Decidueye, but expect it to not help as much most games. However, in Expanded I’d expect it to be much more reliable, as everyone and their mother runs Computer Search. Overall Differences between Diego’s and Pablo’s Lists: Both lists are world-class, yet they each stand for two sides in the classic war between consistency and teching. In Pokemon, where you can’t change your cards between games, every choice counts, and as a result you see an interesting situation where the most consistent and best-teched concepts usually rise to the top. There’s no clear answer which is better, but in a one-event format such as Worlds, where the Gardevoir GX mirror is still relatively young, the cards that get you set up will go a long way. Overall impressions: It looks like I underestimated Golisopod’s chances heavily! With the most appearances of any deck in the top four and a stone’s throw away from the title, Golisopod/Garbodor is yet another strong Stage One deck in the game’s history. Consistency vs Teching, Part Two: These two lists are remarkably similar, but for the fact that Sho’s list has more tech attackers while Naoto’s has thicker lines of the main attackers. Thick lines of primary attackers is another side to consistency, in that you minimize the number of situations where you fail to draw into an important card. I don’t know how these gentlemen’s top four match went, but I’d guess Naoto set up his Wimpods and Garbodors far more easily. Garbodor BKP Emphasis: Despite the strength of Trashalanche Garbodor, both lists placed it in the backseat over Ability-locking Garbodor BKP. Naoko’s list also supplements his build with a Hex Maniac, helping break through turn one Vileplumes. Personally I’d like a balance between these two approaches: I like the space created by Sho’s list, but like the two Garbodor GRI and Hex Maniac of Naoko’s. Sho’s Choice of Tech Basics: This in my eyes will be the unsung “what if” scenario of Worlds 2017. 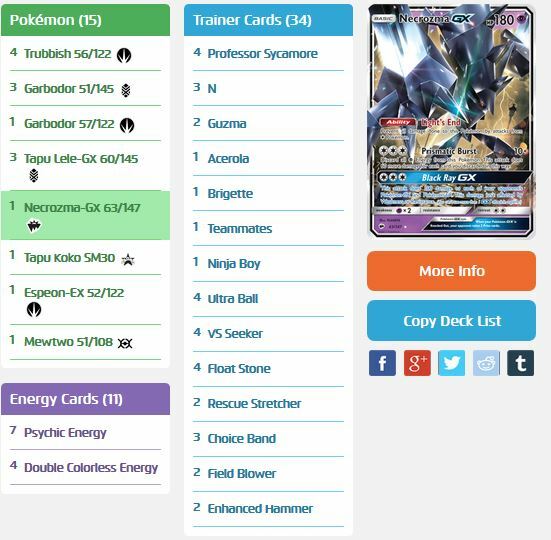 Between Garbodor GX and especially Magearna EX, Sho had a couple unique choices that could have put in a lot of work against Gardevoir – something a more streamlined build could not. Had Naoko’s list included the Magearna, or had Sho’s list been marginally better against the mirror, we might have seen a completely different World Champion. Overall Impression: In my “Big Five” article last week, I predicted that if Garbodor benefited from heavy use and favorable metagame matchups, it would do well. I was more or less right about this prediction, although after talking with Sam, Xander, and Jimmy, each of their schedules featured some very unusual decks – namely the surprise Salazzle GX/Ho-Oh X and Golisopod GX/Garbodor builds. Xander was even paired down to a M Scizor deck, which is surprisingly good when considering Xander runs a Flareon AOR to change his Pokemon’s typing to Fire. I distinguish these decks from the Golisopod builds because Trashalanche is only a side focus there. But considering that 3/4 of the Top Eight consisted of some sort of Garbodor presence, I underestimated its overall effectiveness on the day. 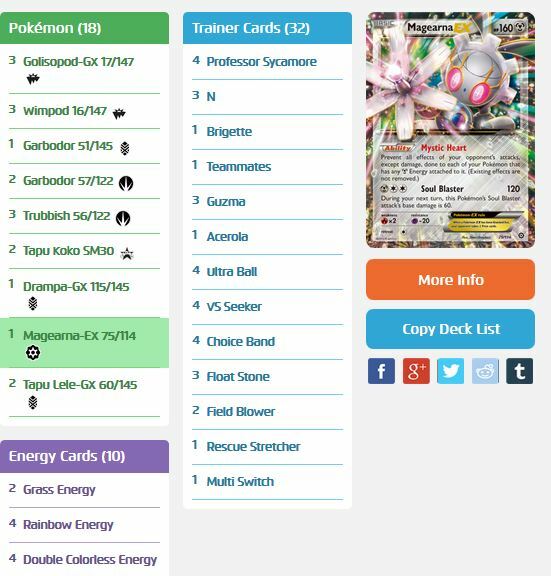 Every variant shined: Between Espeon and Drampa, as well as the “surprise” Necrozma/Tapu Koko build which saw success in Japan’s younger age groups, metagame factors helped propel all three versions of Garbodor into top cut. 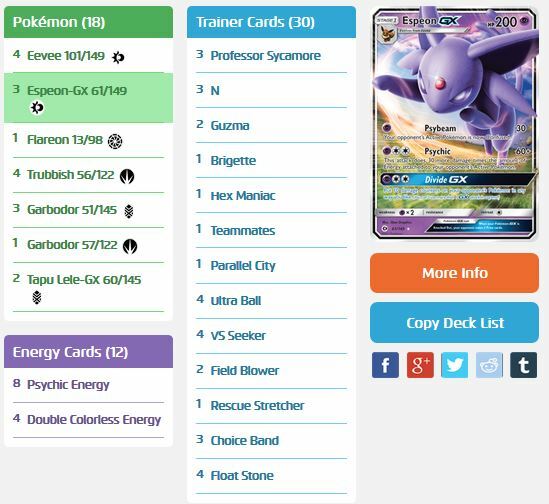 I think Espeon variants in particular shined because they did the best versus the emergent field, which included the above Ho-Oh, Golisopod, and Gardevoir decks: Ho-Oh and Gardevoir are at risk of Espeon GX KOs via Psychic, and Golisopod becomes Weak to Fire thanks to Flare Effect. Drampa succeeded because it was being piloted by one of the more experienced Drampa variant users, and I’m unsure what path Reiji and his Necrozma took to clinch his top eight position. Necrozma was not quite finished: If you’ve played the video games, you can tell that Necrozma’s design is not quite complete. Similarly, the Necrozma variant feels like it is sorely lacking the Tapu Lele promo – a card which was mistakenly allowed into Day One for Japanese players but subsequently excluded from Day Two. The theory of a deck emphasizing spread damage is exciting to see come back, but without the Damage-moving mayhem caused by Tapu Lele’s Magical Swap, it’s not quite there yet. The results of this year’s Worlds were quite memorable, but I doubt the lessons learned from its top finishers will be one-time things. Unlike M Audino’s here-today-gone-tomorrow victory last year, all of these decks will live on in some way for the 2017-2018 season, and I look forward to seeing what’s in store for us next. Hopefully you got something out of what these eight excellent deckbuilders did, and can apply it to your future tournaments!